I’ve written a decent number of music reviews in my life, and my biggest complaint is, frustratingly, a lack of originality. In a time where every band and artist can release a smattering of videos, creating something that stands out gets harder by the day as new ideas -- for better or worse -- are constantly available on social media. Pocket Vinyl managed to take the art of mixed media, stand it on its head, and perfect it on their visit to Sugar City last Thursday, September 7th. The evening consisted of a 30-minute performance by the band, which always includes a painting created live by artist Elizabeth Jancewicz. The performance was in support of the band’s new documentary, Drive. Play. Sleep. Pocket Vinyl’s current tour normally involves just showing the movie, but for this evening, they were asked if they could perform in addition to the screening to the movie. It was a smart choice. The set opened with what pianist/vocalist Eric Stevenson referred to as his own “30-minute Pixar short.” The music was upbeat and poppy -- “slam piano” and ”piano punk” are terms Stevenson uses. With a strong Ben Folds Five influence, he mixes contemporary rock with classical and ragtime elements and also throws in a good measure of percussive elements. The songs featured emotional, sincere lyrics served to the crowd in the form of everything from growling anger to high falsetto. The energy and emotion behind every second of the performance was enough to leave Stevenson out of breath after each song. Eric, who is happy and engaging onstage, told a lot of stories during the set, which included a “Buffalo-centric” set of songs written during the band’s one-month stay in the area in 2016. The set included “Death Anxiety,” “Heaven, Hell & Nihilism,” and “Sink,” in addition to three currently unreleased songs from their forthcoming album including the quiet, introspective “Fein Rage” and “Dumber” & “Effigy” (all working titles). Watching someone paint live created an atmosphere like no other concert I’ve been to. 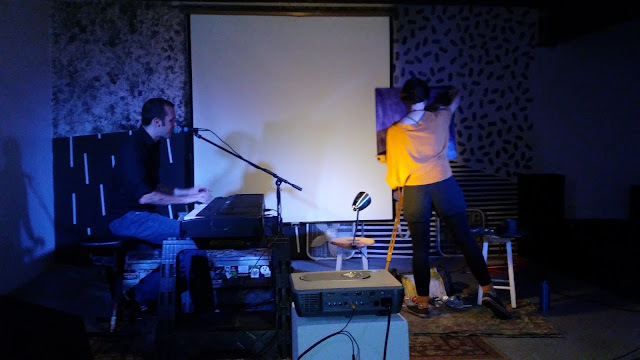 Pocket Vinyl’s performance would have been memorable without the painting, but Elizabeth’s contribution to the performance made the evening extraordinary. She may have been speed-painting (a typical Pocket Vinyl performance is usually closer to 45 minutes or an hour), but you couldn’t tell from the result. Her finished painting (see photo insert) was whimsical, soothing and as impressive as anything you’d find at indie galleries like CEPA or Hallwalls. 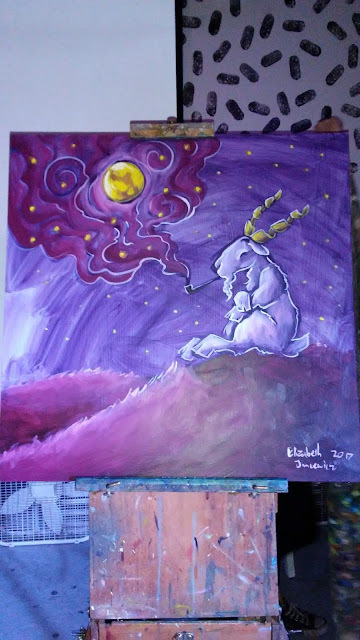 The experience of watching Elizabeth do something as simple as adding little dotted stars to a sky was relaxing to watch, and seeing her creative process an artform in itself. Some might ignorantly refer to Stevenson as a solo act with an artist on stage, but it couldn’t be further from the truth; Elizabeth’s painting carries a calm, steady pulse that paces the show and perfects the atmosphere. As is Pocket Vinyl’s tradition, the painting was auctioned off to the crowd at the end of the night. Amazingly, after 700+ shows, each painting is a distinct, one-of-a-kind original. If the world were perfect, Pocket Vinyl would be selling out arenas, performing on Jimmy Fallon, and plastered on the side of a tour bus while bands like Nickelback play to small handfuls of people in art spaces in places like Possum Ridge, Arkansas. The world is not perfect, but that does mean we get to see amazing acts like Pocket Vinyl in small, intimate settings. They usually play around here twice a year, so hopefully we’ll see them back in the spring. When they come, run, don’t walk, to the concert and know that for next to nothing , you’ll get a great night of entertainment and see something you’ve never seen before. Ryan Gurnett has a B.S. in Music Industry from The College of St Rose. He has worked as a studio engineer, live sound engineer, producer and sound editor and has been a musician for 25 years. He is currently the bassist for The Lady, or the Tiger?. Email him at never_really_been@hotmail.com or find him on Twitter @SirWilliamIdol.